batmanmarch's Action Figure Reviews: Are we back in the 70s? New Doctor Who Chocolate Bars! Are we back in the 70s? 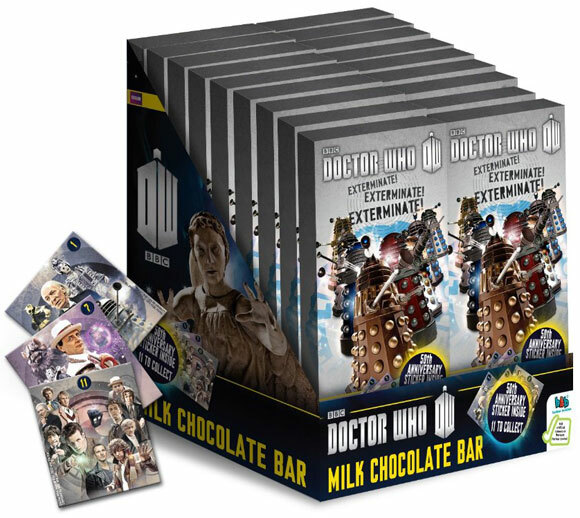 New Doctor Who Chocolate Bars! Yes, Bon Bon are making Doctor Who chocolate bars... Some of you will remember (or at least know of) the various chocolate bars that came out back in the 70s, and I couldn't help but think of them with this modern equivalent. Now chances are the chocolate is going to be quite awful, but the really cool thing is that they come with stickers of the Doctors surrounded by various monsters and villains from their tenure! Very cool! Nice to see that even chocolate bars can teach the young 'uns about Doctor Who. You saw the Chocolate bar with Jon Pertwee on it too, then? The Light at the End!